God of War Comic Mini-Series | Binary Messiah - Reviews for Games, Books, Gadgets and more! I went into this not expecting much. I was half-way through the first issue when it suddenly grabbed my attention. This series plays out — and could be translated to — a full on game. The Gods (Hades, Ares, Hermes, Poseidon, Helios) are bored and make a wager. They find the strongest clans in the world and make something disastrous happen. The Barbarian King’s father is stricken with illness, a female clan suffers starvation, and Kratos new-born child with Lysandra, Calliope, is born with a deformity. The Spartan law is that an ugly baby is thrown out at sea. Lysandra’s mid-wife tells them of a tale about the Ambrosia of Asclepius that can give eternal life and bring back the dead. They both beg the Spartan King to let Kratos bring back this Ambrosia for the King himself and a sip for his baby. That’s one freaking awesome story. That right there is a premise to a whole new God of War game. As the series advances the Gods start cheating because Kratos is obviously winning. He slays large strange beasts, avoids natural disasters, and has the King’s army following him. The series does a good job showing the hot-headedness of Kratos and his selfishness. The Spartan general ends up giving him a lecture on this, we also get some insight on the Spartan ways and how cruel they were. Several times Kratos almost becomes defeated, but we all know the ending here. The art was a bit disappointing. It’s very murky and washed out with black. There’s some realism here, but it doesn’t exactly fit the game’s art style. Sometimes I liked it, sometimes I didn’t. There were a few mistakes like when he had a flashback to his childhood. 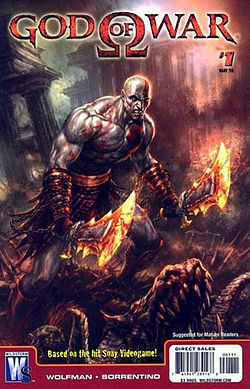 Kratos is drawn with the ashy skin and red markings, but he didn’t get that until after he slew his family. In Ghost of Sparta, Kratos is seen with normal skin as a kid, so there were some screw-ups with the lore here. This series was made towards the tale-end of WildStorm Comics life, issue 6 was done by DC Comics after they absorbed WildStorm. At least the comic is gory and there’s a lot of violence like in the game. While the art may be iffy, it does have an excellent atmosphere of darkness and constant betrayal. It’s a short series but it does the game justice. If you love God of War these six issues should be in your comic collection. The story is so great that it can stand as a standalone game.